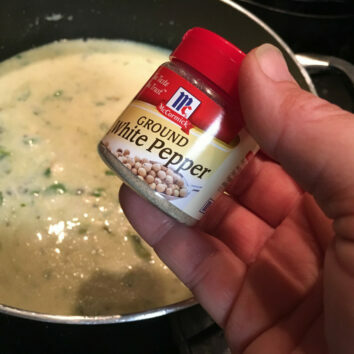 This recipe will satisfy the pepper fans in your family while providing a healthy spin to a traditional cream soup. Because the Anaheim pepper is easy to find you will want to make this most anytime of the year. 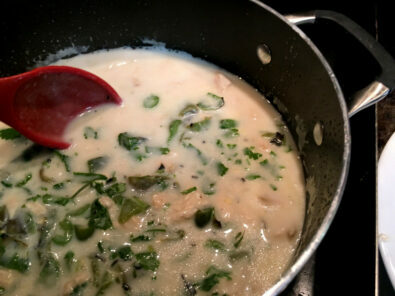 Featured in today’s post is my Spicy Anaheim pepper cream of chicken soup recipe that will have your family asking for peppers. First of all, keep in mind this is a spicy yet healthy spin to your traditional cream of chicken soup that will have everyone asking for seconds. Anaheim peppers can be found at most grocery stores or easily grown in home gardens. Take advantage of the print option featured in the recipe below. Heat large skillet with 1 tablespoon of olive oil. Carefully add fresh not frozen chicken breast that has been chopped into 1/2 inch pieces. Saute for about 5 minutes before slowly adding the chicken broth. Put lid on skilled and let come to boil. Cook for about 15 minutes or until chicken is done. Remove chicken from skillet and let cool so they it can be chopped into bite size pieces. Grill Anaheim peppers – I roast mine on the stove top gas grill. Turn occasionally so the pepper doesn’t burn. Once the pepper is completely blacken remove from fire and let cool on a plate. Once the pepper has cooled whip or peal the blacken areas off. Chop the grilled chilies removing the steams. 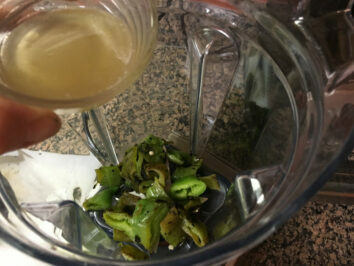 Add 2 of the peppers and ¼ cup of the chicken broth in a food processor or blender and puree. Be sure to keep 2 peppers chopped and to the side. 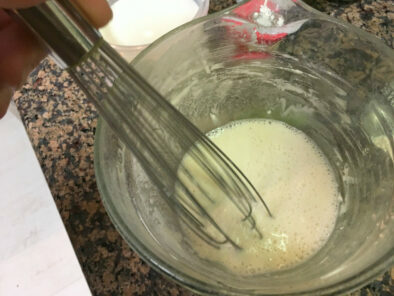 Whisk ½ cup of the broth in a bowl with wine and flour be sure to keep it smooth and not lumpy. Add the wine, flour and broth mix to the skillet whisking slowly into the broth. Bring to a boil before adding the following ingredients. 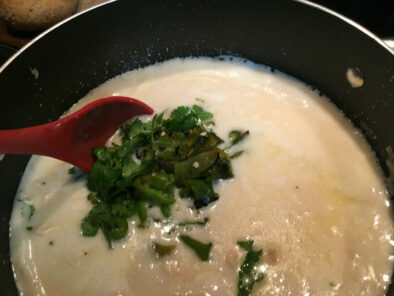 Add the chopped anaheims and puree Anaheim mix, cilantro, chicken and seasoning in the skillet carefully stirring. Do not boil … just heat up the soup before serving with your favorite multigrain roll. This is one of my favorite recipes to create as the temperatures start to drop outdoors and the peppers are still producing in my home garden. Make your dinner guest think you spent hours over the stove with this tasty soup. The truth is, making your own homemade soup really isn’t that hard. Most everything you make from scratch taste better and is loaded with nutrient. The peppers in this Anaheim Pepper Cream of Chicken Soup Recipe pack amazing flavors allow you to keep the ingredients simple. 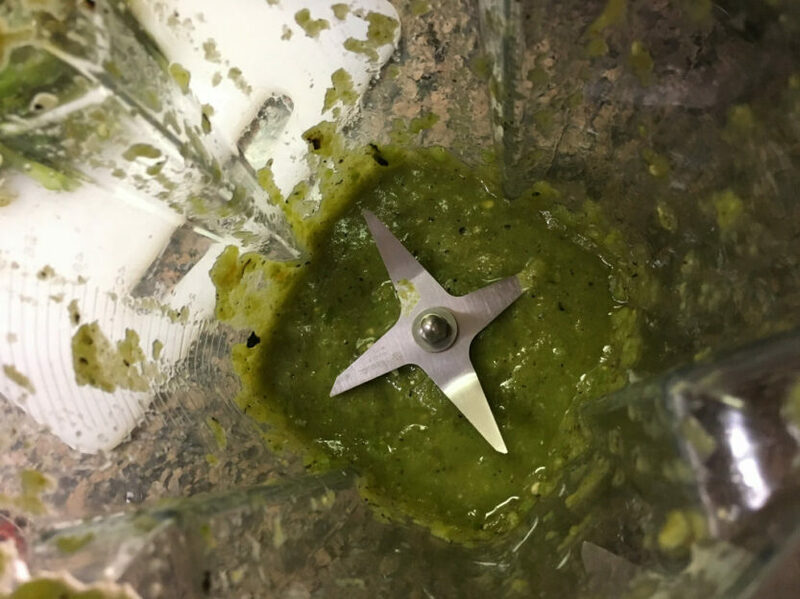 I’m using a blender to make puree – easy! whisk together the wine, 1/2 cup chicken broth and flour. If it isn’t a wine you wouldn’t enjoy drinking at a dinner don’t add it to your recipe. In today’s dish I use a Chardonnay I’ve had in the basement from my trip to the Biltmore Estate in North Carolina. I actually got to go out in the vineyard and talk to the gentleman who over sees the vineyard at this amazing historical estate. The Anaheim pepper has a Scoville scale rating from 500 to 2500 SHU. Other peppers close to this rating can be used in the recipe but keep in mind the Anaheim has it’s own unique flavor. Therefore, I recommend adding this variety to the recipe. If you don’t like heat then get out of the kitchen! [alert-warning]I would love to connect with you and hear all about the peppers you enjoy to add to recipes. The best way to connect with me is to comment on this blog post. Don’t be shy… let me know if you like a little heat in your meal.